Love Pizza but prefer vegan food? this will perfectly fit you! The dough that is made out of these ingredients is enough for 4 large Pizzas. then grease it with some Matbucha or tomato paste, then sprinkle some dry Oregano (possible with fresh too, sometimes we also add Basil and/or Rosemary). 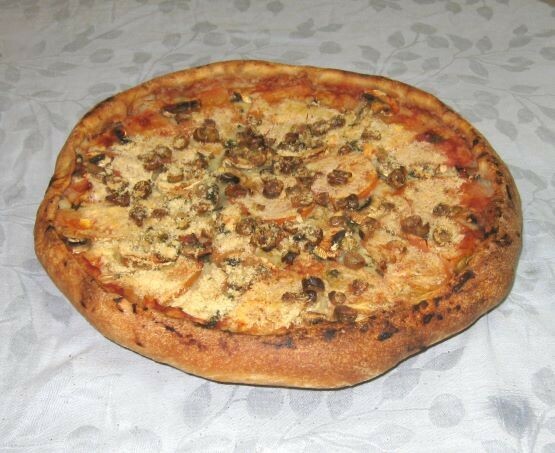 - Grease a layer of potato mash of about 1/2 cm thickness, and then place on top the sliced into plastics tomatos, mushrooms, olives, and then sprinkle brewer's yeast on top (And also you can add some almond cottage cheese to make the Pizza even more cheesy). - The edges can be folded. - Bake it for 20-22 minutes on 220C.